A while back, I ate “Baked Salmon with Cheese Sauce” for the first time, and was very pleasantly surprised. I have always thought that fish and cheese were a very strange combination, but the way this dish was prepared, it just worked, and worked well. I’d definitely order that again. But when I saw the listing for “sushi pizza” (the description reads, “Salmon, cheese, and crab” – mmm) on a menu for Crazy Sushi, a local Japanese restaurant that we really like, and even though most everything from there is great, I just could not imagine there being any way that sushi pizza could taste good. Of course, I had to try it. 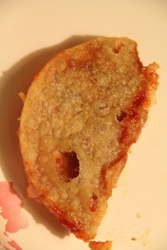 The crust is kind of a deep fried, “tostada” kind of shell – I thought this was a neat choice. I liked the crispness element that gave. And ooh, the menu didn’t mention there was tobiko on top, too! Salmon, cheese, crab, AND fish eggs! The sauce was sweet. 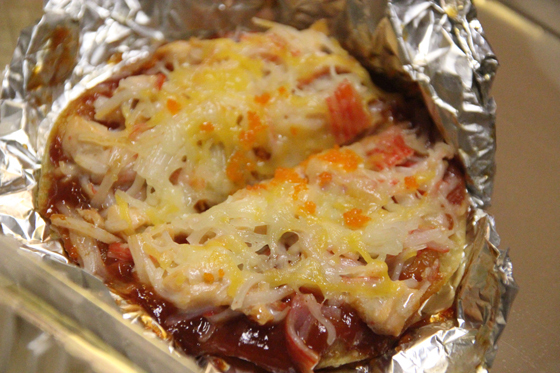 I think this is a bit like the pizzas that are popular in Japan – sweet flavors mixed with seafood, and of course mozzarella cheese. 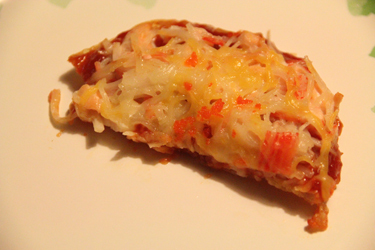 The combination was a bit crispy, a bit cheesy, a lot sweet, and a little seafoody. It wasn’t disgusting or anything, just not my favorite. Final verdict: If you’re looking to try something different, this would totally qualify, and it’s just an appetizer, so you won’t be stuck with a lot if you don’t like it. As for me, I think I’ll stick to gyoza next time!